According to the Dietary Supplement Health and Education Act of 1994, dietary supplements include a large heterogeneous group of products intended to supplement the diet that are not better described as drugs, foods, or food additives. Supplements may contain, in whole or as a concentrate, metabolite, constituent, or extract, any combination of 1 or more vitamins, minerals, amino acids, herbs or other botanicals, and other substances used to increase total dietary intake, including enzymes, organ tissues, and oils. They must be intended for ingestion; sold in the form of capsules, tablets, soft gels, gel caps, powders, or liquids; and not be marketed as food items. This rule requires persons and entities that manufacture, package, label or hold dietary supplement to establish and follow correct good manufacturing practice to ensure the quality of the dietary supplement and to ensure the dietary supplement is packaged and labeled as specified on the manufacturing record. However, even with these regulations in place, the biggest deterrent to people purchasing supplements is the lack of confidence that it can support their health needs. This is reinforced by the fact that consumer trust of the supplement industry is at an all time low. 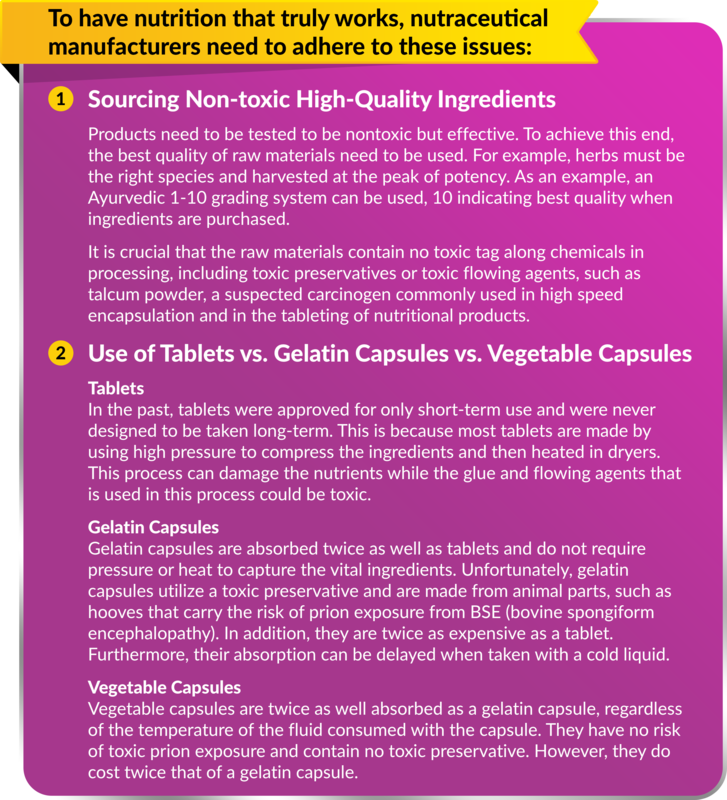 Now more than ever, a supplement company’s integrity cannot be taken for granted, as the FDA does not check supplement company’s products to ensure what is on the label, matches what is in the product. To ensure the highest efficacy, potency, purity of supplements, a company’s manufacturing methods need to be evaluated to ensure it is going beyond the minimum quality mandated by law, and you know what they are not telling you, so that you do not end up with products that do not work. In fact, over the years, some studies have shown that up to 90% of the nutritional supplements on the market today are inferior. They may not meet label claims; their contents may be poorly grown, contaminated, heat damaged, solvent extracted, irradiated, fumigated, or just having the wrong species etc.